Donald Trump rattles markets and raises questions about his policy towards China with mixed signals and suspect claims over tariffs. Last weekend the Trump Administration proclaimed a breakthrough with talks at the G20 summit between Trump and Chinese leader Xi Jinping. The headline was a sharp contrast to the trade war in which Trump has imposed tariffs on almost half of Beijing’s exports to the US and threatened to put duties on the remainder. But cracks soon appeared in the declaration. The substantive advance was limited to a delay in the escalation of US tariffs from 10% to 25% on January 1, and to China’s general statement of a “willingness” to take in more American goods. The White House warned that the tariff escalation will be imposed if trade talks make no advance in 90 days, and China’s statements did not match other claims made by the Trump Administration. On Tuesday, Trump fuelled concerns as he labelled himself a “Tariff Man” and said he was ready to impose higher duties if he was displeased with China’s actions. The US stock market reacted with one of its largest falls in recent history. Trump changed tack on Wednesday by playing up the prospect of a trade agreement. He pronounced, “China does not want Tariffs!”, and quoted a Bloomberg News report that Chinese officials have begun preparations to restart imports of US soybeans and liquefied natural gas. Beijing has responded to Trump’s tariffs with duties on $110 billion of American goods and commodities — almost 80% of the value of the US exports to China. Soybean farmers in the US Midwest have been hard hit, with reports of loss of more than 90% of overseas sales. After silence on Tuesday, China’s Commerce Ministry said yesterday morning that it will act quickly on specific items where there is “consensus” with the US and will proceed on negotiations within the 90-day “timetable and road map”. US markets were closed on Wednesday for the funeral of President George H.W. Bush. 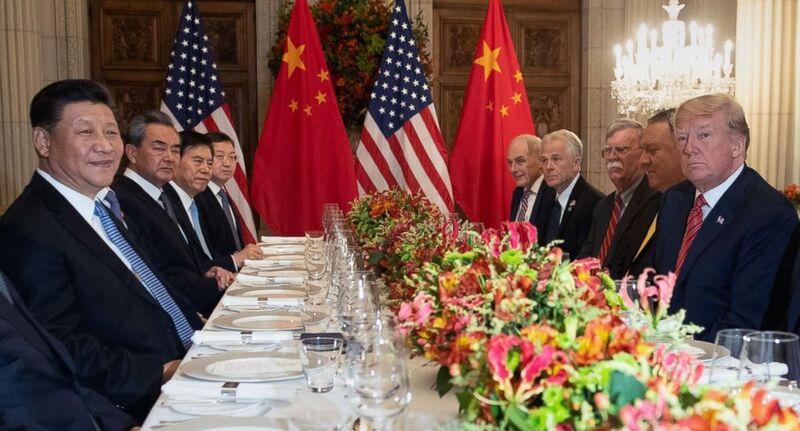 Howevever, trade and industry experts raised doubts about a White House declaration that China has agreed to purchase $1.2 trillion more in US goods and services, almost 10 times the current trade figure. A Treasury spokesman said that the $1.2 trillion increase will take place over several years. The US is projected to export about $1.7 trillion in goods to the entire world this year. A top Chinese executive was arrested on Saturday in Canada at the request of the US. Meng Wanzhou is the chief financial officer of the Chinese tech giant Huawei and the daughter of the founder. Ian McLeod, a spokesman for Canada’s Justice Department, said Meng was “sought for extradition by the United States” but did not give a reason for the arrest, with a publication ban requested by Meng on the details. A bail hearing has been set for Friday.